A novel technique is presented that makes it possible to measure the viscous shear stress τμ from active thermography. With a CO2 laser, patterns are written to the sea surface. This temperature structure is distorted by the linear velocity profile in the viscous boundary layer. Due to the non-zero penetration depth of both the laser and the infrared camera, this vertical velocity profile can be resolved. By resolving the velocity profile, the viscous shear stress can be extracted from the recorded image sequences. At the same time, the flow field at the water surface can be measured accurately. Estimating both quantities is only possible by modeling the imaging process as well as the velocity profile in the boundary layer. The model parameters can then be computed in a standard parameter estimation framework. 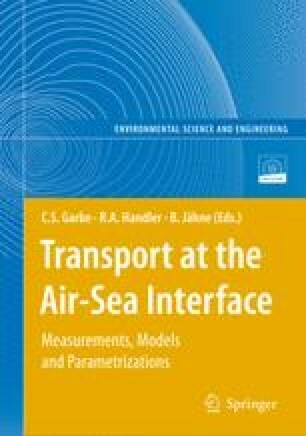 This novel technique was tested both on simulated data and on measurements conducted in a small annular wind-wave flume. The friction velocity computed in this fashion compared favorably to independent measurements. Although not tested yet, this technique should be equally applicable to field measurements.